Renewable energy is a great way to reduce your energy bills and help the environment by cutting carbon emissions. Solar PV systems are one of the most popular renewable products in the UK and businesses as well as homeowners can take advantage of the energy saving possibilities. Of course, businesses will require larger installations to see a bigger saving on their energy bills and solar panels can easily save you hundreds or even thousands of pounds every year. In a similar way to solar panels for your home, a PV system for businesses will be fitted to the roof in a south or southwest facing direction. This ensures that the solar panels can be as efficient as possible, producing optimal levels of electricity. The system works by converting natural light into electricity. This is created when the two layers of silicon make an electrical charge. This electricity is then converted into usable power for lighting and other appliances. Solar panels for businesses can prove to be even more effective than home installations as businesses will carry out most operations during the day. The Government’s lucrative feed-in tariff scheme, which launched in 2010, offers an incentive for the uptake of solar by paying for every unit of renewable electricity generated. This is paid for up to 20 years. Gas and electricity prices are set to rise so taking advantage of renewable energy is a way of ensuring a cheaper future for your business. Sell any excess electricity to the National Grid at a set rate and ensure all energy generated by your system is used in some way. Solar panels help the environment and Government 2020 targets by reducing carbon emissions. These emissions are directly responsible for global warming issues. 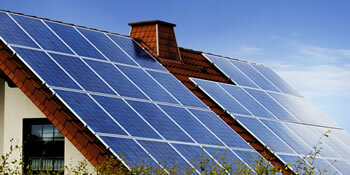 Solar panels are a great way to cut your business’ bills and reduce the carbon footprint. They allow you to cut your spending whilst also guaranteeing a fixed income over 20 years. For up to four FREE solar panel quotes from local, vetted solar panel installers, simply complete our quick form. Project: We are looking for quotes for solar panels to be fitted to our Charity building. We are applying for a grant to have the work carried out so need a quote before Friday. Project: We have a large wedding venue - current annual electricity charges are over £45K - want to look at the possibility of creating around an acre of ground mounted solar panels. They explained everything so it was easy to understand. Impressed with product and salesman. However, as an agricultural-based operation still waiting for EU subsidy payments from Scottish Government since December, our cash f;ow has been severely hit and we could not consider proceeding with project. Re instant response to my enqurirey , no long wait involved! Provided contact companies quickly; only quibble was too much pressure for feed-back at early stage of project.